Anna University will conduct April May June 2017 UG PG 2nd 4th 6th 8th Semester examinations were completed and the results will published soon after the paper valuation. As per Anna university schedule, the classes already ongoing for Anna University UG PG 2nd 4th 6th 8th Semester. Get Latest Updates On Anna University Chennai Madurai Coimbatore Trichy Tirunelveli Time Table for APRIL / MAY - 2018 for 2nd 4th 6th 8th. Anna University 2nd 4th 6th 8th Semester APRIL / MAY - 2018 Time Table announced, Practical and Theory examinations will be conducted in that manner. Anna University, Chennai(R2013 & R2017) Schedule was published, Now you can Download the Official Anna university time table 2017 for the May June examination using the below links. 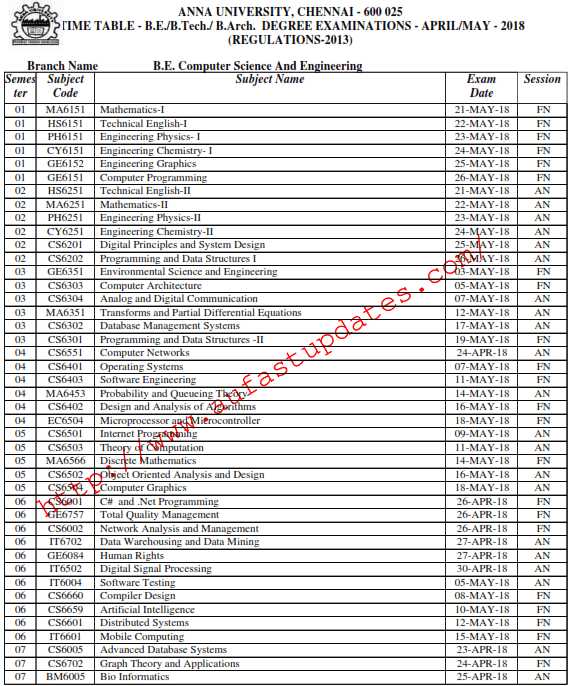 Anna university exam time table for regulation 2008 and other regulation TT's will be announced soon. Stay Tuned with us for more updates. If you get 403 forbidden error.Try in Chrome browser (OR) edit the URL link and add http:// in front once again, press enter to view the page. 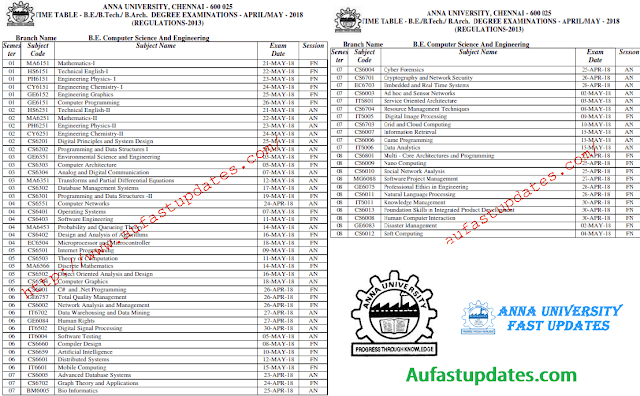 Here Below You can Download Anna university April May 2018 timetable for 2nd 4th 6th 8th Even Semesters and 1st 3rd 5th 7th Arrear exam schedules. M.B.A. / M.C.A. / M.Sc. / B.C.A. Stay tuned with us for Anna university Fast Updates on 20187 for 2nd 4th 6th 8th semester APRIL/MAY/June 2018 Chennai Coimbatore Madurai Trichy Tirunelveli Examination timetable.